2016-17 Publication 360, Guide to Fruit Production – now available online | Chatham-Kent Agriculture Development | We Grow For the World! 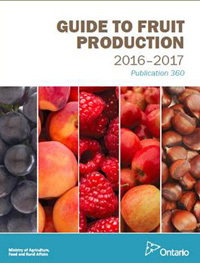 2016-2017 Publication 360, Guide to Fruit Production, is now available on the OMAFRA website. The english publication is posted as a fully accessible pdf and also as individual chapters. The French pdf is not the accessible version but the information is complete and the final accessible pdf will be posted later this spring.